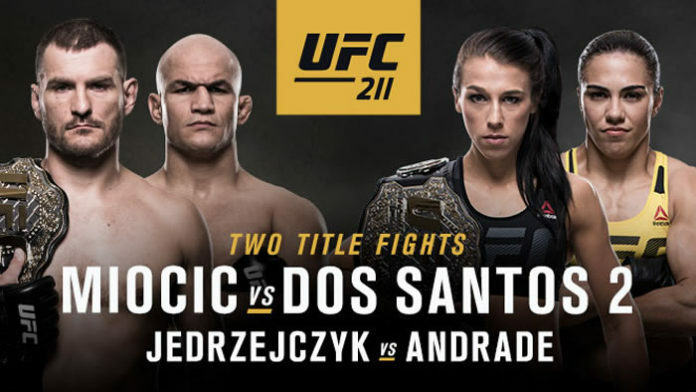 UFC 211: Miocis vs. dos Santos 2 – UFC returns to Dallas. UFC 211: Miocic vs Dos Santos is held on May 13 at the American Airlines Center in Texas. The event is the fourth UFC promotion in Dallas. The organization made its debut in September 2009 with UFC 103. It has then hosted UFC 171 in 2014 and UFC 185 in 2015. In the main event the current UFC heavyweight champion Stipe Miocic (16-2-0) of the US is fighting a former title holder, ranked No.4 Junior dos Santos (18-4-0) of Brazil. The bout is also a rematch. The pair has previously fought in December 2014 with Dos Santos earning a unanimous decision. In the co-main event the current UFC women’s strawweight title holder Joanna Jedrzejczyk (13-0-0) of Poland is facing off ranked No.3 Jessica Andrade (16-5-0) of Brazil in defense of the belt. Also on the card Gabriel Benitez (19-6-0) of Mexico is taking on Enrique Barzola (13-3-1) of Peru in the featherweight bout. As well, Ranked No.3 in the welterweight class Demian Maia (24-6-0) is squaring off with ranked No.5 Jorge Masvidal (32-11-0) of the US. In the lightweight bout, ranked No. 3 Eddie Alvarez (28-5-0) of the US is going battling out against his country-fellow, ranked No. 9 Dustin Poirier (21-5-0). Ranked No.2 in flyweight division Henry Cejudo (10-2-0) of the US is going up against ranked No.6, also American Sergio Pettis (15-2-0). In addition, rankned No. 2 in featherweight class Frankie Edgar (20-5-1) is fighting ranked No.8 Yair Rodriguez (11-1-0) of Mexico. Also, James Vick (9-1-0) of the US vs Marco Polo Reyes (8-3-0) of Mexico in lightweight bout and American fighters Chas Skelly (17-2-0) vs Jason Knight (19-2-0) in the featherweight contest. Ranked No.10 in the middleweight division. Krzysztof Jotko (19-1-0) of Poland vs Dave Branch (20-3-0) of the US starts the program. The most recent promotion was UFC 209: Woodley vs Thompson 2 on March 4 in Las Vegas. The next event is UFC 210: Cormier vs Johnson 2 on April 8 in Buffalo.